Finally I can post again! After having my website hacked for nearly a month, we were able to solve the problem. I never would have thought, that the jetpack plugin from wordpress would be an open entrance for bot and hacker attacks… Everytime when I thought we fixed it, I wanted to log in the next day and same cryptic dashoard grinned at me and my own website was telling me I would want to cheat, when I tried to post something as I would not have the permissions to do so. Lesson learned, jetpack plugin deleted! Thank you to all of you, who had patience with me for not being able to post something. I used a lot of different parts to mix and match my todays look. The jacket I found at COCO, the top is from Scandalize, the corset with the cool warp around and ribbon I found at Paperdoll’s, while the pants are a part of the amazing “Y6” collection from [sYs]. I do love mix and match a lot, even if it became significantly harder, since mesh is on the grid as layering different designers can be a real hard challenge if the clothing is not meant to go with each other. 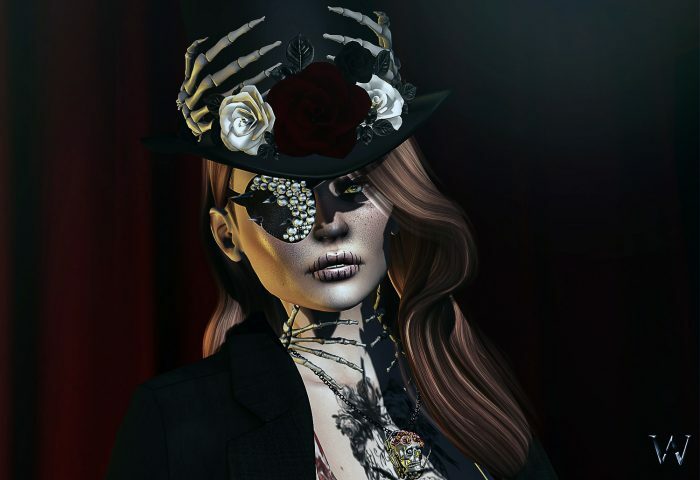 The “Leisha” choker from Salt & Pepper ran right in to my heart when I saw it :p I love the look of the 2 skeleton hands, that wrap their bony fingers around your neck 😉 While I went through my headpiece & hats folder I came across the “Dia De Los Muertos Hat” from .AiShA. with the same cool grabby bone fingers holding the top of the hat!